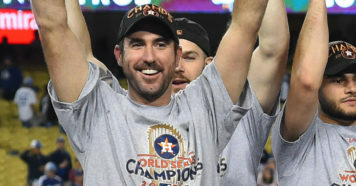 Justin Verlander is the best story of the MLB season so far. 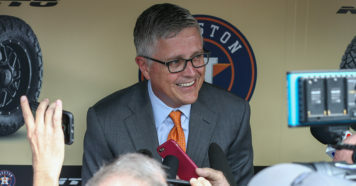 The move to the Astros last summer turned out to be a breath of fresh air for the ace, who may be pitching the best he’s ever pitched in his life. He currently leads MLB with a 1.05 ERA and a 0.71 WHIP. He already has an MVP, Cy Young and six All-Star games on his resume. But through all of his accomplishments, one game sticks out in his mind as a summation of his career: his 124-pitch complete game 2-1 win against the Yankees in Game 2 of the ALCS last year. Get this: Justin Verlander has led MLB in pitches per game started every year from 2009-12 and 2015-17. The 124 pitches he threw against the Yankees were the most thrown in a complete game in the postseason in 14 years. “I was lucky to have a manager that allowed me to go deeper in the game and allowed me to throw more pitches,” Verlander gushed about former Tigers manager Jim Leyland. “Because that’s what I’ve been trained to do. I’m blessed to be able to still be strong at 120 and 130 pitches and he allowed me to do that and allowed me to showcase that. That got us thinking. If Justin Verlander’s entire career led up to that game last fall, where does it rank among the best games of his career? There were almost too many to choose from. Here’s our list of the best games of Justin Verlander’s career, ranked. The Tigers weren’t supposed to have a shot at beating the Yankees in the 2012 ALCS, but Verlander made Detroit into a contender with a strong Game 3 performance. After two wins at Yankee Stadium, the Tigers turned to Verlander to secure a 3-0 series lead. He retired the first 10 hitters and wound up allowing just three hits through 8.1 innings in a 2-1 win. It’s early in the season still, but Verlander has been setting the tone for what’s to come. On a regular Wednesday at Angel Stadium, Verlander pitched a complete-game shutout, the eighth of his career, in a 2-0 win over the Angels. He struck out seven, walked one and allowed just five hits on 118 pitches. More notably, he became just the 33rd pitcher to reach 2,500 strikeouts in a career, joining C.C. Sabathia as the only other active pitcher to accomplish the feat. And maybe you don’t believe that Justin Verlander is the best story in MLB this season. Maybe you think it’s the Angels’ two-way phenom Shohei Ohtani. Well, Verlander struck out Ohtani to reach 2,500 strikeouts. We’ll call Ohtani the second-best story. It wasn’t Verlander’s best no-hitter. But it was, in fact, a no-hitter. He only had four strikeouts against the Blue Jays, but allowed just one baserunner, a walk in the eighth inning. His outs came on 12 groundballs and five pop flies. Verlander faced just 27 batters and tossed 108 pitches in the 9-0 win over Toronto at the Rogers Centre. Before this game, he’d struggled through seven games, notching a 2-3 record with a 3.75 ERA. After this gem, he went 21-2 with a 2.18 ERA in 26 starts en route to his MVP and Cy Young. This one was so close, yet so far. In a 6-0 win over the Pirates at Comerica Park, Verlander fell just two outs short of another career no-hitter. Pittsburgh’s leadoff man, Josh Harrison, hit a single to center field to break up the no-hit bid, which also featured 12 strikeouts from Verlander. The most impressive part? Verlander faced 30 batters and threw 109 pitches, 76 of which were strikes. Who needs a no-hitter when you’re mowing down batters in that manner? Maybe it wasn’t a playoff game. Okay, it wasn’t a no-hitter. But a 95 game score on Baseball-Reference makes this one of the two highest scores of Verlander’s career. Turns out, three baserunners and 12 K’s in a complete game is pretty hard to beat. Verlander’s complete-game win against the Yankees last year wasn’t his first in the postseason. In a do-or-die 2012 ALDS Game 5 against the Athletics, Verlander stepped up his game. He pitched a complete-game four-hitter that featured 11 strikeouts and just one walk. And to complete the feat, he only had to face 31 hitters, throwing 83 strikes on 122 pitches. The 6-0 win marked Verlander’s second victory over Oakland in the series. If this matchup sounds familiar, it’s because it is. Just like in 2012, the Tigers were in a must-win Game 5 against the A’s on the road. Like in 2012, Verlander worked his magic and kept the Tigers alive in the playoffs. He retired the first 16 batters of the game before allowing a walk in the sixth, and Yoenis Cespedes broke up his no-hitter with two outs in the seventh inning. Verlander only made it through eight innings, but he allowed no earned runs, just two hits and struck out 10 hitters in the 3-0 win. For his two combined Game 5s against the A’s, Verlander pitched 17 innings, allowed six hits and two walks while striking out 21 with no runs allowed. And remember: these were elimination games. The ace allowed five hits and one earned run while striking out 13 on 124 pitches in a 2-1 win against the Yankees in Game 2 of the ALCS. 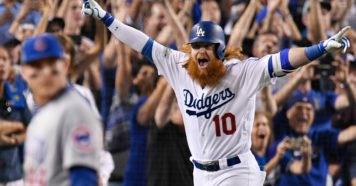 He ultimately went on to notch the win in Game 6 against the Yankees en route to a World Series win, his first title after spending 13 seasons in Detroit. It was the game his entire career had led up to. But it wasn’t the best game of Verlander’s career. Of the 297 no-hitters thrown in MLB history, Verlander has two of them. As one of the rarer feats in MLB, it’s impossible to forget the first time a pitcher throws one. Verlander’s first was on June 12, 2007 against the Brewers at Comerica Park. Not only was it is first career no-hitter, but it was also the first no-hitter in Comerica Park history and the first thrown by a Tiger pitcher in 23 seasons. In one of his first real flashes of greatness, Verlander struck out 12 and walked four hitters, facing just 30 batters on 112 pitches. This would be his first of two 95 game scores, and it would be the best game of his career to date. But Verlander is getting better. Will he beat that performance before he hangs up the spikes?